This item was purchased by Peabody Essex Museum, Salem. 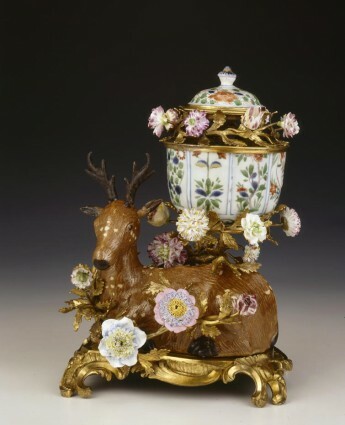 Ormolu-mounted porcelain pot-pourri vase, mid-18th Century, comprising a Chinese porcelain stag on a European ormolu rococo base, both mid-18th Century, one branch supporting an ormolu-mounted late-17th Century Chinese Kakiemon bowl and lid, converted from a teapot, the knob Japanese, all mounted with brightly coloured Vincennes porcelain flowers. One porcelain ear and one metal antler of the stag original, the others European replacements. Provenance :- The Lords Rossmore, Barons of the United Kingdom and Ireland. Literature :- William R. Sargent, Chinese Export Ceramics from the Peabody Essex Museum, 2012, no. 257, pp. 464-5. 1. See Porcelain for Palaces, The Fashion for Japan in Europe, 1650-1750, 1991, no. 190. 2. David Howard and John Ayers, China for the West, 1978, Vol. II, No. 609, pp. 586-587.